Music students at The Sixth Form College, Solihull have been working with a “Composer in residence” from the Birmingham Conservatoire this term. Daniel Cippico is a 4th year Composition student at the Birmingham Conservatoire and has been visiting College every other week. 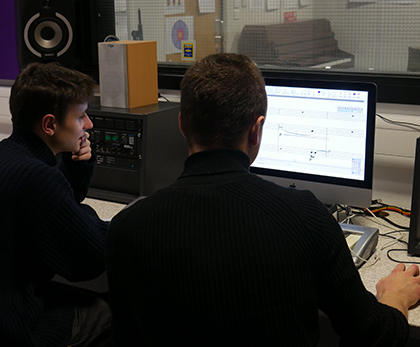 A talented composer and musician, Daniel has been working with both A level Music and Music Technology students on their compositions and coursework. He has also been sharing some of his own work with our students to get an insight into studying music and composition at a higher level. Composing forms 30% of the A level Music course, with another 30% of the grade coming from Performing and 40% from an examination that assesses their appraising skills.